Volusion specialists in designing the custom solution! Volusion is one of the premier eCommerce software companies on the market. They have been in business since 1999 and there is a huge number of features, more than enough to help any company have their chosen eCommerce website. Indeed, consumers often remark that the tools and features offered by Volusion seem to be limitless, especially when it comes to marketing and payment options. You can also rest assured that you site will be safe from hackers thanks to Volusion’s excellent security features. We are able to customise Volusion eCommerce Stores enhancing the core features that the system has to offer into an all in one Custom Volusion Design service, working with our customers to ensure that their expectations are met is our standard policy. With other eCommerce software packages, setting up an inventory list can be a burden. Volusion neatly sidesteps this issue by offering various software packages with differently sized inventories. You have the option to sell physical goods or else you can opt to deal with downloads such as eBooks. It is also possible to upload your products in bulk. 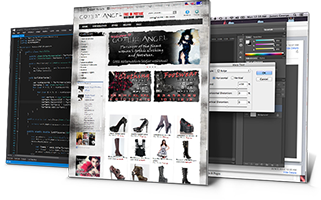 Interested in finding out more on a Custom Volusion eCommerce Design? Please Contact Us for a free consultation on how we can help.